No Mess, No Lifting, No Spills. No Bucket! I bought this unit after I discovered some signs of mold growing in my basement and this dehumidifier works like a dream. It's bucketless feature is great because I don't have bust my hump to constantly carry buckets of water across the room to empty it (who am i, jack & jill?!). Best of all it's so quiet, you can hear a mouse fart. Even on high, the sound is no louder than a ceiling fan or some other type of fan. 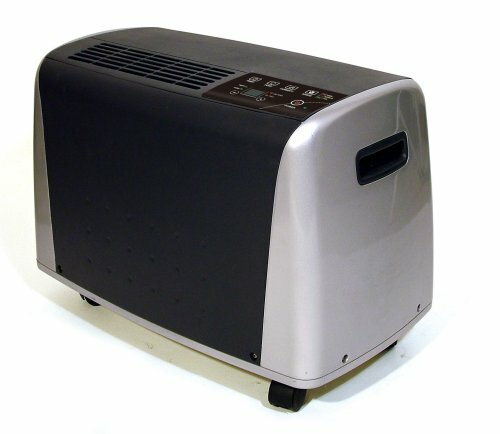 I've been looking to get a dehumidifier for a while and finally settled on this dehumidifier. I really like the bucketless feature because I never empty buckets of water now. Nice for my back. Also the design is nice and compact so it won't take up a lot of space. I am really disappointed in this dehumidifier. It doesn't have an automatic shut-off. If you don't constantly check on it, it runs all the time. You can set it to run for so many hours and then it will shut off - you have to turn it back on then. You can set it to turn on in x number of hours, but then you have to go and turn it off.